Yesterday I posted a handful of notes relating to the recent rash of specialty sweaters both in the NHL and the minor leagues. I saved a couple for today because they're just a certain kind of crazy that deserve a post all their own. Tomas Kaberle #15This one, too, begins with the Toronto Maple Leafs. Earlier tonight, they joined couple of other NHL clubs who have paid tribute to the military with special camouflage warm-up jerseys in 2009-10. Don't misunderstand, these teams always seem to have their hearts in the right place when they do these things, but I do think it's sometimes a bit nuts. The Leafs offered a few more details regarding the reason for tonight's military-themed sweaters. More than 360 Canadian Forces personnel attended the game at the invitation of Maple Leaf Sports & Entertainment. Gen. Walter Natynczyk officiated the ceremonial puck drop before the game, and was visited at centre ice by former Leafs goaltender Johnny Bower, who was in full military garb. If you're interested in more pictures from the warm-ups and pre-game ceremonies, the team's web site is happy to oblige. For the record, it appears, to me at least, that the Leafs were wearing the same Reebok-made camo jersey that the Blackhawks and Ducks wore earlier this season. Icehawks' Star Wars jerseyAlso tonight, the IHL's Port Huron Icehawks hit the ice wearing what I can only describe as a visual atrocity. At least most teams are bringing awareness to an important cause or donating auction proceeds to a worthwhile charity. 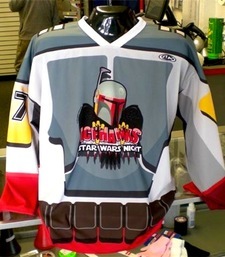 The Icehawks are just dressing up in Star Wars-themed jerseys for an evening! All right, to be fair, these jerseys are being auctioned for charity — the Cherry Beach Council on Aging. And before you scoff, think of your grandmother. Star Wars jersey in actionThe Port Huron Icehawks are hosting their 3rd annual Star Wars Night on Saturday, January 30, 2010 at McMorran Arena. The players will be wearing specialty Star Wars jerseys to be auctioned off for charity. Proceeds benefit the Cherry Beach Council on Aging. Bounty hunters from all over the galaxy will want this one-of-a-kind piece of Icehawks/Star Wars memorabilia! 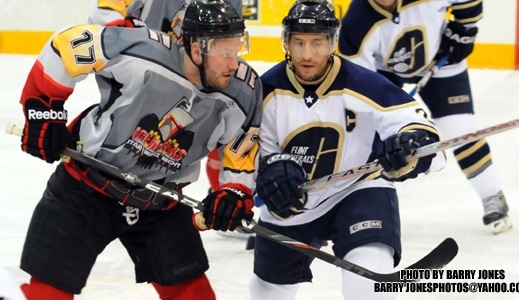 The action goes into hyperspeed as the Icehawks take on the Flint Generals at 7:30 p.m. These extremely cool jerseys were designed by Great Lakes Garrison member Scott "Crow" Withers TK-1491. Two things: 1) Playing fast and loose with the term "extremely cool," aren't we? 2) This is the third time they've done this?! It's true. A photo gallery, for those among you who would dare to boldly go where no... wait, that's not right. Finally, we end the night with the OHL's London Knights. These guys normally wear green and gold, but when it comes to raising cash for the Make-A-Wish Foundation, they're all about the blue and gold. For those who can't read the text on the image, here's all of the information we have relating to the special jerseys. On Saturday, February 6th, be part of the House of Blue in support of the Make A Wish Foundation of South Western Ontario, presented by The Brick. Knights players will wear blue jerseys which will be up for auction following the game with all proceeds going to Make A Wish. Join the London Knights and wear Blue!!! I'll keep an eye out for pictures of these special jerseys next weekend. Thanks to Ryan for the Knights tip, Victor for sending along the Icehawks link and Shaun for drawing my attention to the Leafs' military night jerseys.